As the nights grow darker the risk of burglary increases, with the majority of opportunistic thieves using big events such as Halloween, Bonfire Night and Christmas to their advantage. Did you know that November is the month you are most likely to be burgled? Store all bins and ladders away from your home. These could be used by an intruder to access 1st floor windows. Never leave any valuables where they can easily be seen. Have a spy hole or door chain fitted to keep out any unwanted guests. It can be a good idea to leave a light on or on a timer, especially during the darker evenings and if you are spending a night or week away from your home! Leaving a television or radio on is also a good alternative to leaving the lights on. Security products such as a light with a timer can be purchased online. If you are going to be away for a long period of time ask the Royal Mail to hold your mail with their ‘Keepsafe®’ service – they will do this for up to 2 months. It is recommended to ask the Royal Mail to hold your letters as this avoids a pile up of post inside the front door which could be an invitation for an intruder as they will be able to see you’re away. Join or start a Neighbourhood Watch scheme. “The Neighbourhood Watch works to bring neighbours together who want to look out for each other, creating strong, friendly, active communities where crime and antisocial behaviour are less likely to happen.” To find your local Neighbourhood Watch, or for information on how to start a Neighbourhood Watch scheme, please visit the Neighbourhood Watch website. Alternatively if you don’t have a Neighbourhood Watch in your area and are going away for any period of time, inform a trusted neighbour that you are doing so, so they can keep an eye on your property. Whatever time of year it is, it’s always a good idea to have a key hook fitted internally away from the front door or have a key safe fitted externally to your property. A letterbox cage/guard is also recommended as intruders will often use the letterbox to retrieve keys stored inside the house; this type of theft is referred to as ‘Key Fishing’. Make sure you have lights with sensors in the garden and front of your property, this will help to deter an intruder as they are more confident when working in the dark. Check the locks on all doors interior and exterior to your home, including gates or sheds and upgrade/replace if necessary. Make sure anything that can be used by an intruder to gain entry to your property, i.e. garden tools, are safely locked away. When leaving your property always remember to lock any doors and windows. The majority of intruders will use an unlocked door or window to gain entry to a house. If possible park any vehicles in a garage or a protected area. Parking your car in a garage or a protected area will help to prevent vandals from egging or damaging your vehicles. Fit motion-sensing lights to the exterior of your home. Increasing the lighting on the outside of your property will help to deter vandals as they will be more visible to you and your neighbours. Be friendly. 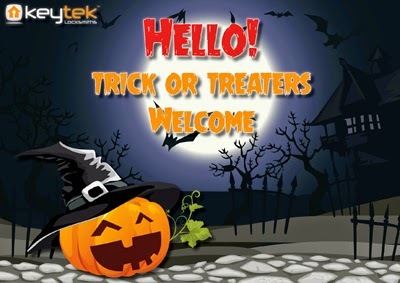 If Halloween is your thing then why not put up a sign welcoming trick or treaters; a poster welcoming trick or treaters can be downloaded here… The majority of people will only tend to prank people that have been unwelcoming, so just make sure you are well stocked up on candy and you shouldn’t have any disgruntled trick or treaters. Turn off the main lights inside your house and shut the curtains. 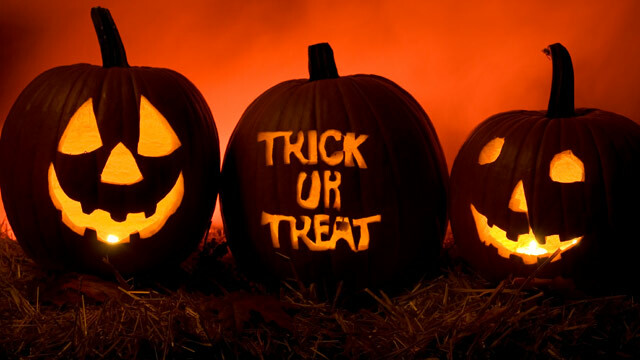 The majority of trick or treaters will avoid your home simply because they will think you are either asleep or not home. Move garden ornaments out of sight, preferably in a locked garage or shed. Popular home insurance claims during this time of year are usually for smashed windows and damage to doors and garden furniture.